A guide to the best baby and toddler friendly hotels, villas and aparthotels in Portugal including hotels with splash parks, on the beach and near to water parks. Discover the best places to stay with babies and toddlers in Portugal and the Algarve. 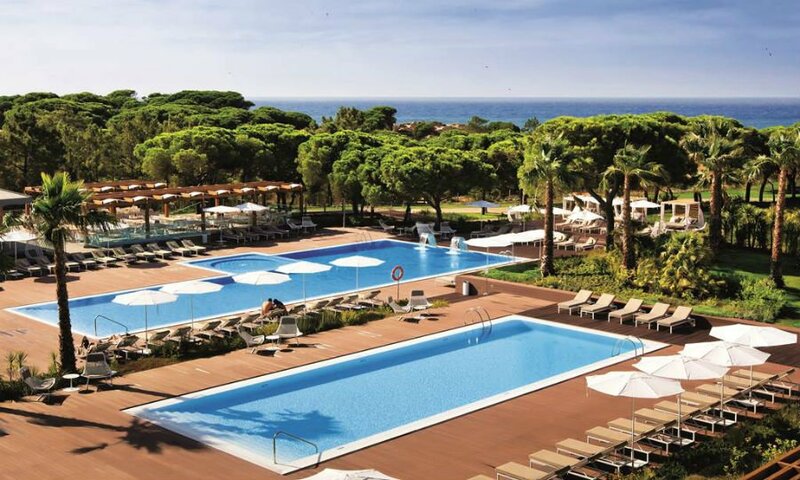 This luxury 5* family friendly hotel is on the beachfront and surrounded by 20 acres of pine trees. It has state of the art modern facilities including 5 swimming pools (including 2 kids pools and 1 indoor pool), and the Savanna Spa and Wellness Centre, which is the ideal escape for tired parents or for those wanting to keep fit on holiday. 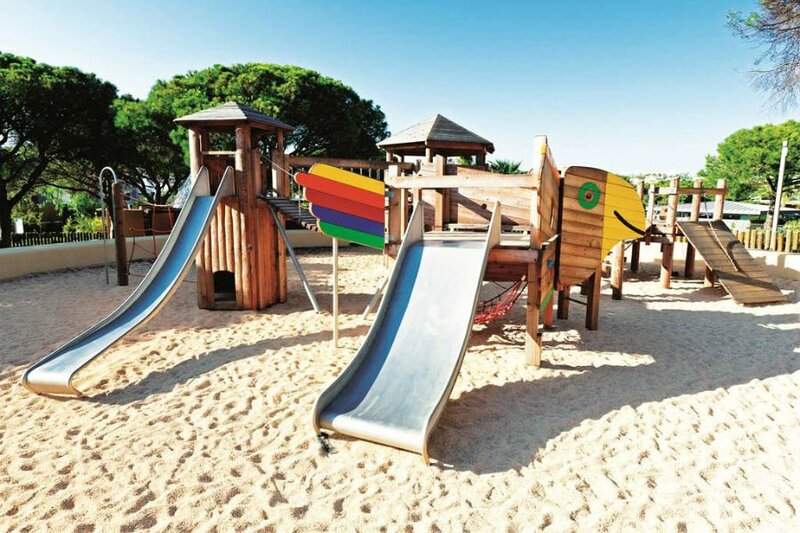 There is a Kids playground, and direct access to Falesia Beach from the Epic Sana hotel. The larger resorts of Albufeira and Vilamoura are just 10km away. Albufeira Marina is a lovely place for a wander in the sun, and for more active days don’t miss the Zoomarine theme park. This marine life inspired theme park is just outside Albufeira and has animal shows, including dolphins and birds of prey, a 4D cinema, aquarium and rides. There are also swimming pools to cool off at. There are lots of restaurants at the Epic Sana. The Abyad Restaurant serves buffet food as well as an a la carte menu, and has highchairs and a kids menu. There is a range of double rooms, apartments and suites which can accommodate up to 4 people. 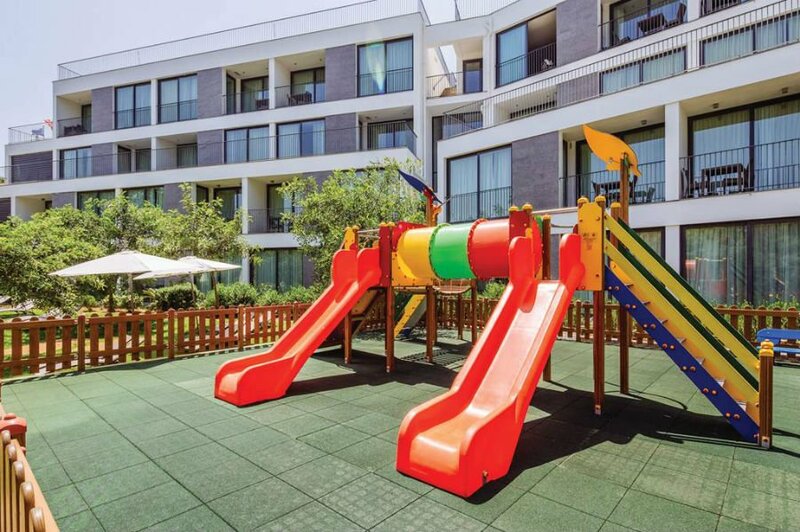 The Alfagar Alto Da Colina Aparthotel has amazing facilities for babies and toddlers including a splash park with tipping water buckets and fountains and a Kids swimming pool. There is also a playground with a climbing frame, slides and a shaded area for when toddlers want to let off some steam. The hotel offers plenty of day time entertainment as well as live music and cabarets in the evening. The 1 bedroom apartments at the Alfagar are all really spacious and well equipped, with limited kitchen facilities including 4 cooking rings, a fridge, kettle, microwave and a toaster. There is also a buffet restaurant onsite as well as snack bars and pool bars. Guests can upgrade to Half Board basis if they wish. The hotel is 900m from the beach, and just over 2km from the Albufeira resort. There is a shuttle bus 3 times a day to the Old Town. Location wise there are two beaches within a 10 / 15 minute walk from the hotel with beach bars, and the resort of Olhos De Agua is a 20 minute walk away. Albufeira resort is just over 2km away and there is a shuttle bus 3 times a day to the Old Town. The Brisa Sol Aparthotel is in a great location within walking distance of the Old Town at Albufeira and the sandy beach. A real favourite with families, the Brisa Sol has a large outdoor swimming pool, a separate kids pool and an indoor pool if you want to escape from the sun for a bit. There is also an indoor play area for children aged 2- 10. The one bedroom apartments have air con, as well as basic kitchen facilities such as a fridge, kettle, toaster and microwave. The apartments are serviced daily, and there is a supermarket next door where you can buy the essentials. Top Tip – Don’t miss a trip to the highly recommended Cake Shop next door! 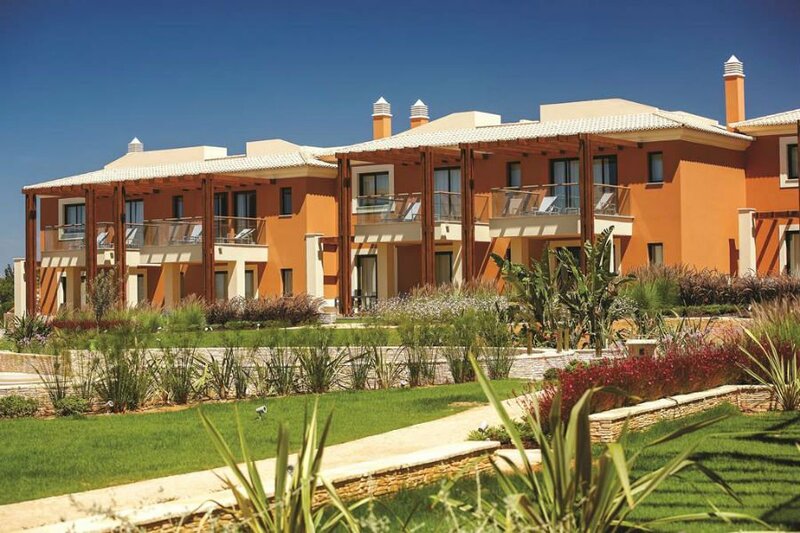 The Alfagar Village has a range of baby and toddler friendly apartments in the Algarve. They are located in a cliff top position overlooking the Atlantic Ocean set in a protected area of natural beauty including 11 hectares of gardens. There is an onsite water park, pool bar, 2 a la carte restaurants and a freshwater outdoor swimming pool. The sandy beach is just a 10 minute walk away (down steps). It is a 15 minute walk into Albufeira in one direction, or 15 minutes in the other direction to Olhos De Agua which has some lovely bars and restaurants. 1 and 2 bedroom apartments are available with kitchenettes so you can prepare basic meals and snacks. Self catering, bed and breakfast and half board is available. 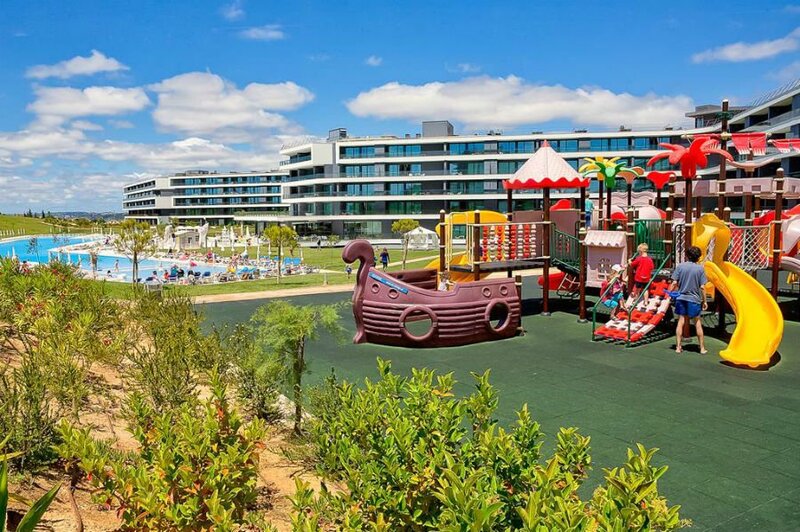 The Pestana Dom Joao II is a great choice for babies and toddlers who love playing on a sandy beach as there is direct access to the Praia de Alvor beach from the hotel. It is also close to Alvor Village with its traditional bars and restaurants. There are 2 outdoor swimming pools including a kids pool, and an indoor one too. 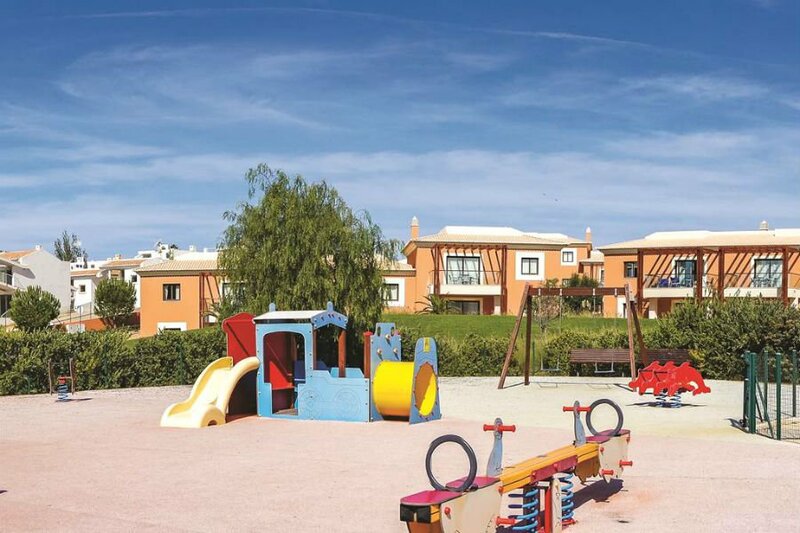 If you are looking for a toddler friendly villa complex in Portugal, then check out the villas at the Eden Resort. There are stylish villas in a peaceful location surrounded by lavish landscaped gardens. There are 5 outdoor swimming pools, including 2 children’s pools, and 1 indoor swimming pool. There is also a buffet restaurant and 3 cocktail bars. There is an indoor soft play area (suitable for children aged 4+), but toddlers will love the outdoor play area with its swings, slides and climbing frame. Please note that the Kids Club is only available for children aged 4+. The Eden Resort is just 2km from Albuferia Old Town, and there is a shuttle bus which runs 4 times a day. Alvor is a great place to take a baby or toddler as it has a gorgeous beach and lots of family friendly bars and restaurants. 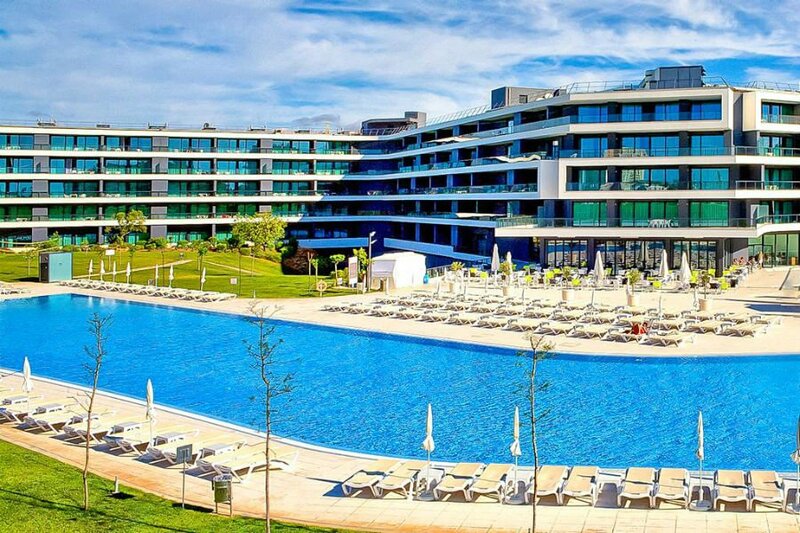 Right on the beach, the 4* Pestana Alvor Praia Beach Hotel has uninterrupted views of the Atlantic Ocean and is surrounded by lush gardens. The entire hotel has been recently refurbished, and provides high quality accommodation in Deluxe, Superior and Suites. There is an outdoor salt water swimming with a children’s section, and an indoor swimming pool too. Access to the beach is via steps or a lift which you can fit a buggy in. Half board and bed and breakfast options are available. 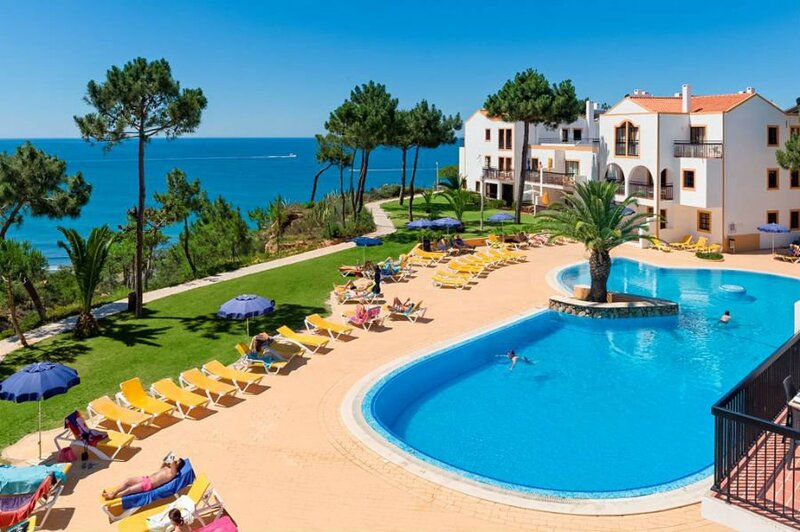 The Alvor Bahia Resort Hotel is a top choice for families wanting a hotel in Portugal with a splash park. There are 2 outdoor swimming pools, including a Children’s pool, as well as the Splash park which has a water squirting dragon and elephant slides for toddlers. 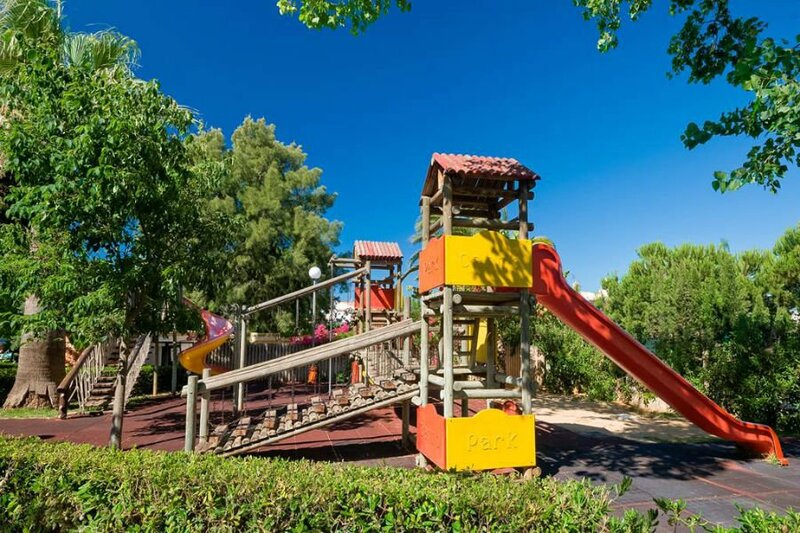 Away from the pool, there is a children’s playground with a climbing frame, slides and adventure play area, and a daily entertainment programme. The All Inclusive package is a popular option for families, and includes a buffet breakfast, lunch and dinner as well as snacks at selected times during the day. Accommodation is in suites which include a microwave and fridge. The hotel is 2km from the beach, and there are regular beach shuttles throughout the day. 3 days entrance to the Slide & Splash is included with stays. 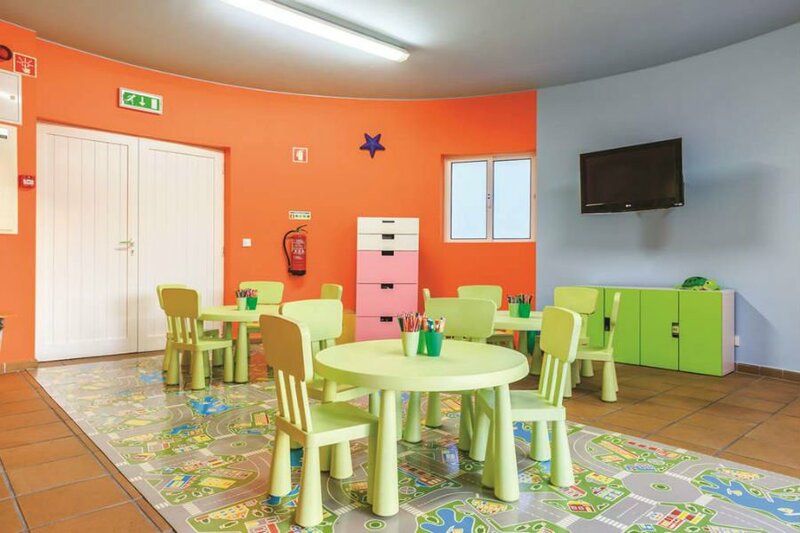 The Clube Humbria is a great option for families looking for a baby and toddler friendly apartment to stay in in Portugal. Recently nominated as one of Tripadvisor’s Best Hotels For Families, the apartments are light and airy surrounding a large pool area, and the beach is just a 10 minute walk away. 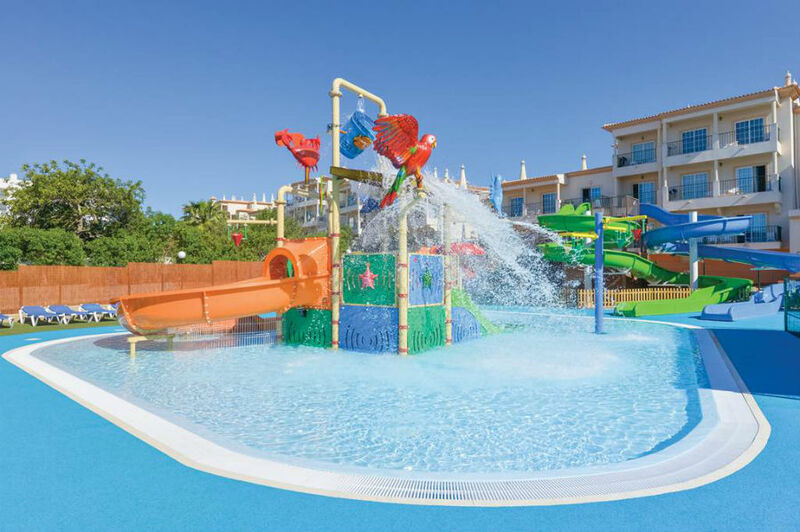 One of the highlights of the Club Humbria is the new splash park with tipping buckets and slides – perfect for toddlers! Away from the pool, there is also a children’s playground. The apartments are spacious and have a little kitchenette with a proper fridge and sink so you can prepare small meals. The Rocha Brava Village Resort is a complex of villas and apartments in a cliff top setting overlooking the Atlantic Ocean. It is a low rise development with lakes, landscaped gardens and 4 outdoor swimming pools. There is also a children’s playground with swings and slides. The Villas are very well appointed, and are cleaned every 2 days. There is also an excellent restaurant onsite and 2 very good cafes which are reasonably priced. In addition there is also an onsite supermarket. 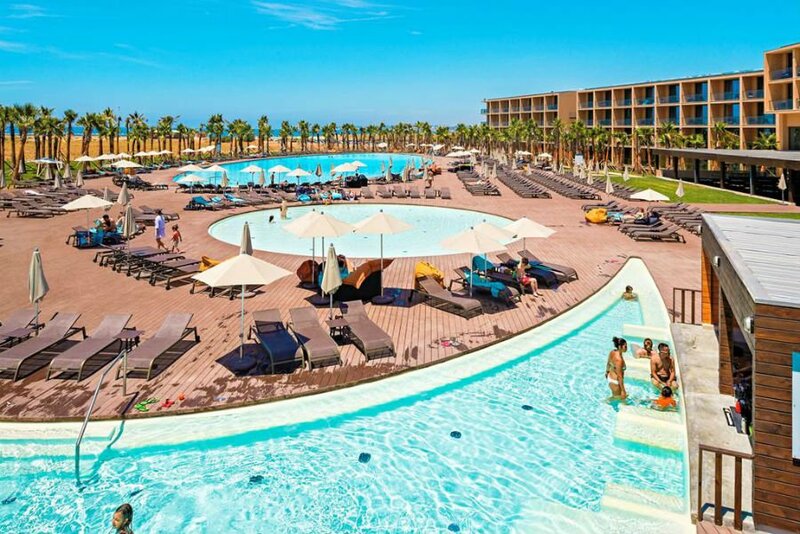 The Rocha Brava Resort is very quiet and peaceful, but is close to Carvoeiro, as well as attractions such as Slide and Splash and Aqualand. The beach is 1km away. A shuttle bus to Carvoeiro runs 3 times a day. 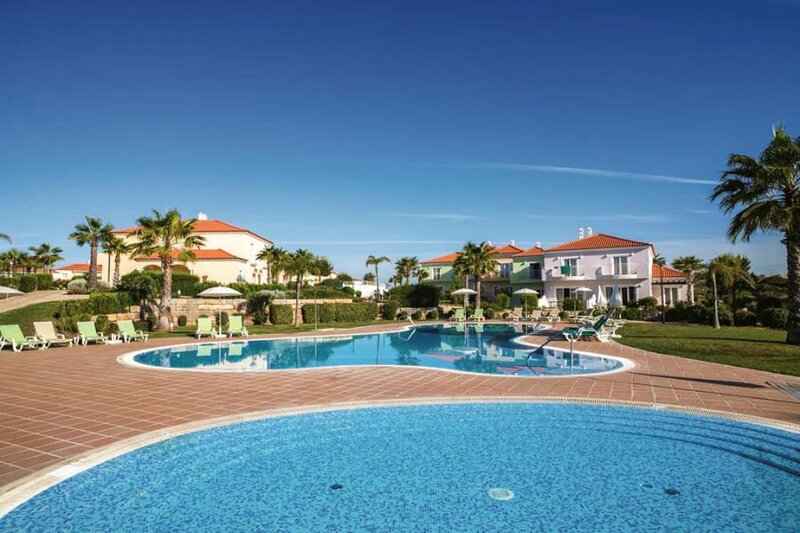 The Be Live Family Palmeiras Village is located in the village of Porches with magnificent views over the Atlantic Ocean, and just a short walk from the beach. 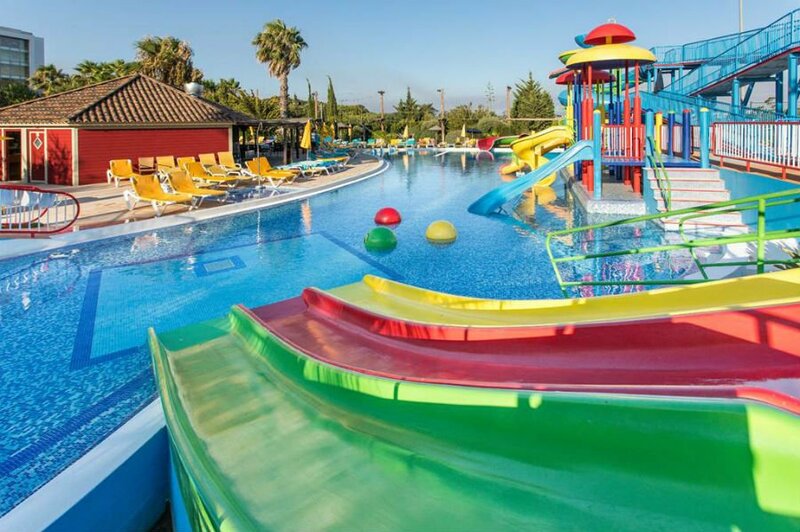 This fun filled toddler friendly resort has a swimming pool with slides and waterfall, water guns, sprinklers and water cannons which you won’t be able to get your toddler out of! Plus there is a children’s playground too. There are also 6 restaurants including 3 buffet restaurants and 3 a la carte restaurants serving a range of Chinese, Thai and Japanese food. There are also 4 bars too. Choose from either the All Inclusive or All Inclusive Plus options to make the most of your holiday. The All Inclusive Plus option includes selected international branded premium drinks and one meal a week at the Rodizio Brazillian and Seafood A La Carte restaurants. Please note that although the beach is only 300m away, access is via steps which might be tricky if you have a buggy. The 5* Monte Santo Resort is an impressive hotel with luxury townhouses and suites, 6 outdoor swimming pools and 1 indoor pool. There is also a playground. The stunning resort has everything that parents and little ones will need on holiday, and the beach is just a short shuttle bus away. Don’t miss taking your toddler on a tour of Carvoeiro on the tourist train which departs every 40 minutes from a stop close to the hotel. Zoomarine and the slide and splash waterpark are also close by. The 5* VidaMar Resort is in amazing location with direct access to the beach and also just 500m from the Lagoa Dos Salgadoes Nature Reserve. There are 3 superb swimming pools and 2 indoor pools, and an indoor soft play (for children aged 4+). The creche is for children aged up to 3 and has a TV, DVD player, toys and books, and is open all day giving parents a chance to enjoy the swim up Tiki Bar which the little ones are having fun. Don’t miss a trip to Zoomarine, which is a marine inspired life inspired theme park with animal shows, dolphins ad birds of prey. 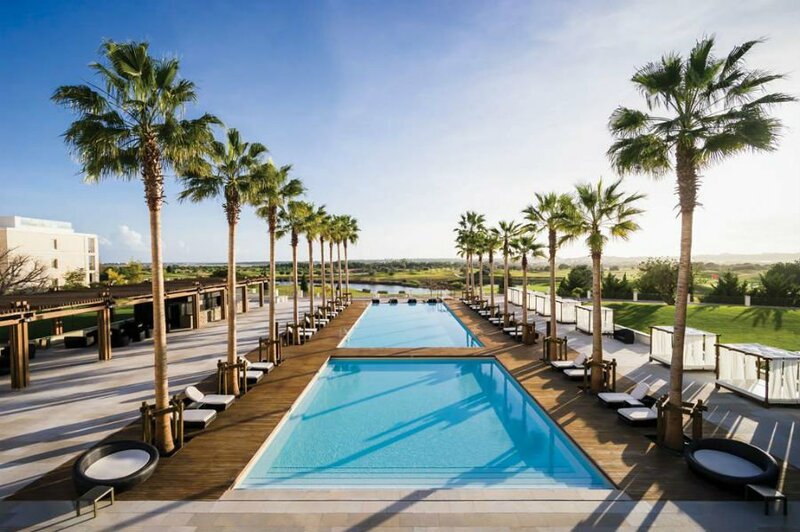 The elegant and modern Anantara Vilamoura Resort combines grandeur and indulgence with positively welcoming babies and toddlers. There are impressive outdoor swimming pools, an indoor swimming pool as well as a children’s playground with swings and slides. There is a dedicated creche for children aged 4 months to 3 years old and includes a soft play area, ball bit, toys and a sleeping area. Parents will be able to relax in the Anantara Spa or golfers will love playing at the prestigious Victoria Golf Course. The stylish rooms have stunning sea views, and the resort also boasts a la carte restaurants. There is a complimentary bus to Vilamoura Marina throughout the day. 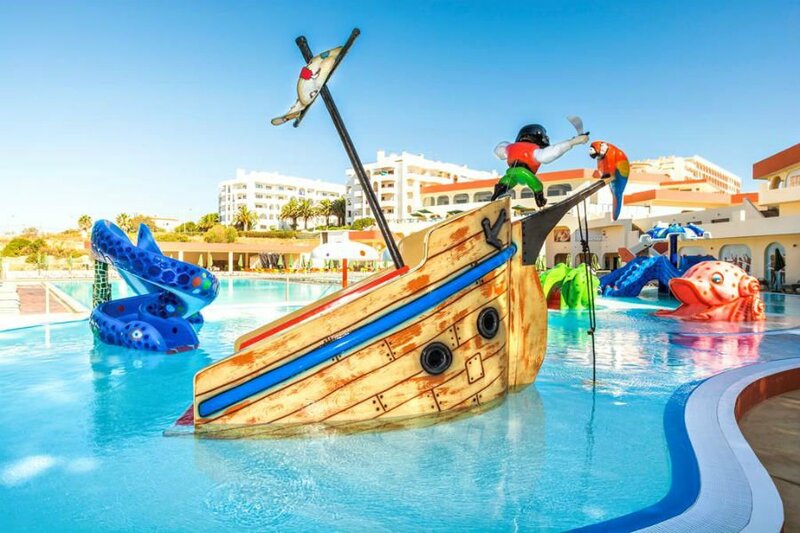 This resort is perfect for action loving families who are looking for a hotel with plenty of activities, entertainment and an onsite water park. The All Inclusive programme is popular with families as it includes ice creams all round! Modern and comfortable family rooms are available. Complimentary shuttle buses run to the beach, and the resort of Albuferia is also close by. All bookings (Apr – Oct) include 3 days entrance to the Zoomarine theme park including transfers. The Albufeira Sol Suite Hotel is a busy resort close to the main strip of Albuferia. The beach is a short walk away, and there are plenty of activities at the hotel to entertain families of all ages. Toddlers will love the large outdoor swimming pool and playground. Suites sleeping up to 4 people are available. 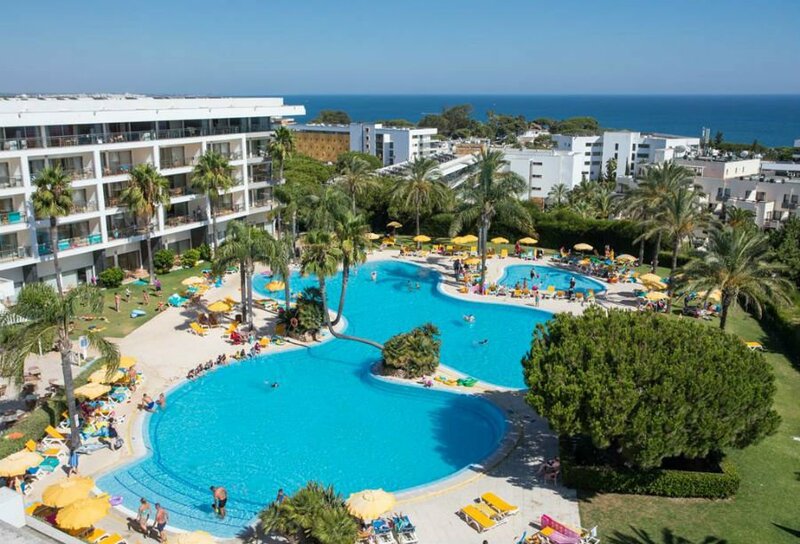 One of the best things about the Albufeira Sol Suite Hotel is that all stays between April and October include a 3 day pass to the Zoomartine water and theme park in Guia including transfers to and from the park. The luxury Monchique Resort & Spa is in a quiet location nestled in the mountains away from the beach. The spacious suites are stylish, while homely, and some have 2 bathrooms and panoramic views. The resort is known for its dining experiences which include fresh fish, creative meat dishes and buffets. There is an impressive outdoor swimming pool, indoor swimming pool and playground. Parents can relax in the extensive spa facilities or sip a cocktail in the bar. Can you recommend any baby and toddler friendly hotels, villas and apartments in Portugal?